Behind The Thrills | The NEW NightTime Studio Tour makes a surprise debut at Universal Studios Hollywood! 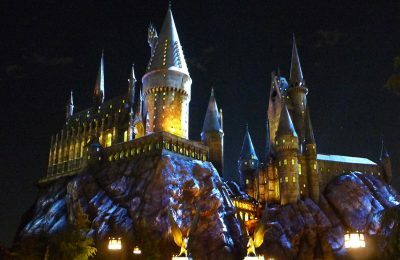 The NEW NightTime Studio Tour makes a surprise debut at Universal Studios Hollywood! The NEW NightTime Studio Tour makes a surprise debut at Universal Studios Hollywood! It’s not supposed to open for over a month, but Sunday night, announced only to those in park, the NEW NightTime Studio Tour made it’s debut at Universal Studios Hollywood for a brief technical rehearsal. The tour features new lights, new portions of the tour, and old creatures returning. It even features a little insight into how movies do night shots, and brings back a little movie history. The new tour had it’s very first public test on Sunday night, and if this first run is any indication, guests are going to have their socks knocked off. It’s also worth noting that since this was just a technical rehearsal it’s very possible that not everything included in the Final NightTime tour was shown to guests on that day. The tour isn’t officially opened until July 4th, and when it does officially open, it will only run for a short time. Guests in park, however, were treated to teases of the tour, with many saying it would open at 6:30. The tour is basically the park’s “goodnight kiss” to guests. And what a kiss it is! The backlot completely comes to life with new scenes, including an array of projections, and a whole new dimension to the normal daytime tour. 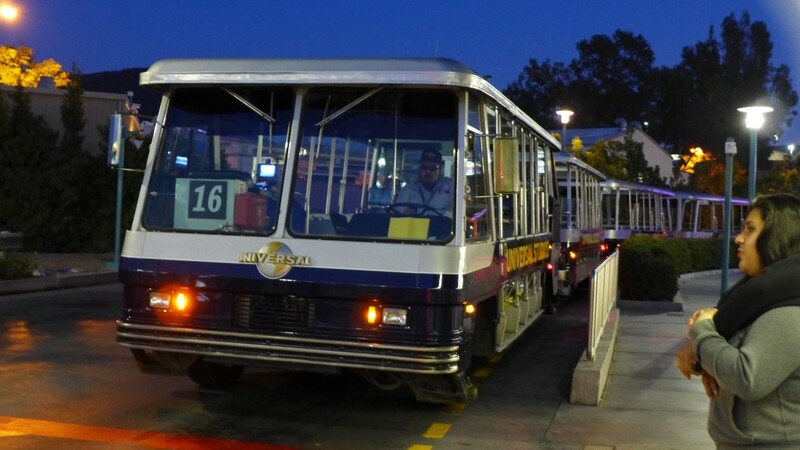 Newly renovated trams can also be seen, though the full fleet has not yet been overhauled. Video – Marilyn Monroe greets guests on the Nighttime Studio Tour! Characters like Marilyn Monroe have pre-recorded dialogue where they can interact with guests as they pass by. Iconic characters have been added all throughout the new tour, and it positively makes things pop! Adding the new characters definitely gives a new depth to the tour that is really fun. 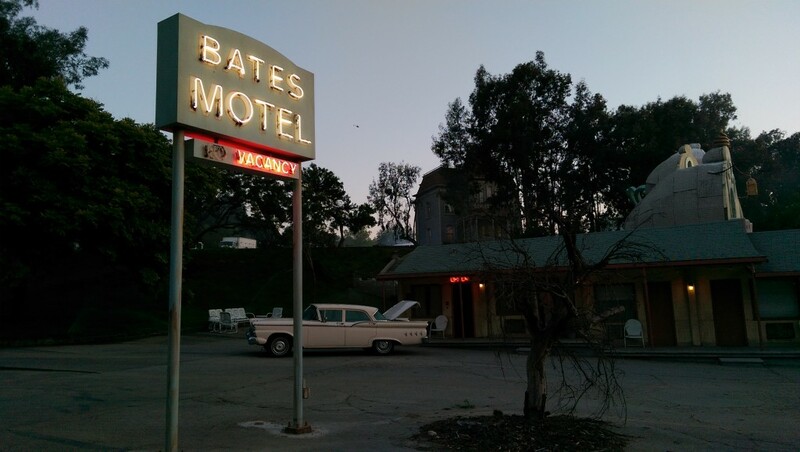 Norman Bates paces in and out of the Bates Hotel, wielding a knife, not caring who sees him disposing of a body. If you’re lucky, you’ll be able to see “mother” pacing the house from the inside, through the use of projections. 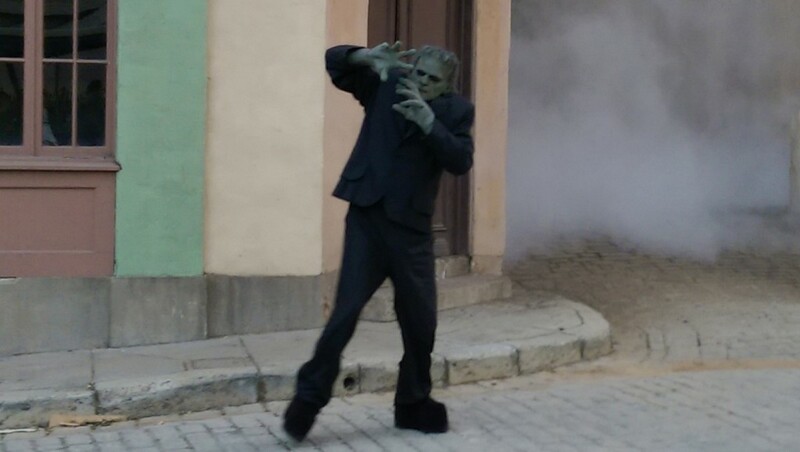 Frankenstein also stumbles out, using fog to signal his approach, and lunges towards the trams in Little Europe. It’s little details like those that make the tour stick out, combining live actors, projections and special effects to create an unforgettable experience. The sets, which guests have loved for years, now come to life with the actors and special effects like they never have before. Video – Encounter Frankenstein’s Monster Close Up! Old favorites like JAWS have a fresh look, and the lighting is really amazing on the tour. Projections also play a huge part in things like Six Points Texas, and Jurassic Park. There are tons of others as well, but those two stand out as hugely vivid and important parts of the tour. 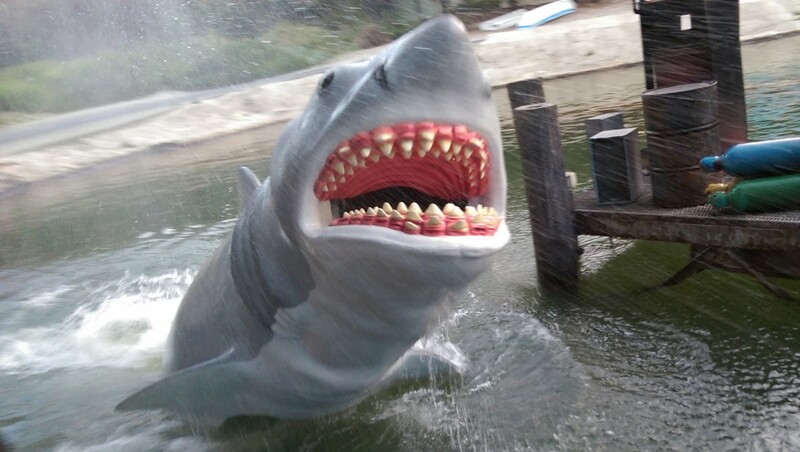 Video – Don’t go in the water at Night, you’ll never know what you will find, JAWS! Video – Watch an old West Saloon Come To Life at Six Points Texas on the Nighttime Studio Tour! Projections have added a huge element to not only movies, but also theme park story telling. The creative team can film a scene, edit it, and have it play over and over again, without having a crew of tired employees risking injury every few seconds. The projections can also bring on an attack of Jurassic proportions! Dinosaurs are going to be a hot commodity this summer, as Jurassic World prepares to take over theaters on June 12th. Universal Hollywood hasn’t forgotten dinosaur fans, as an all new projection, mixed with some amazing lighting effects, and of course tons of fog. It takes a serious dinosaur breakout, and turns it into a nightmare like situation. Of course, it’s not only projections that get tons of love here either. 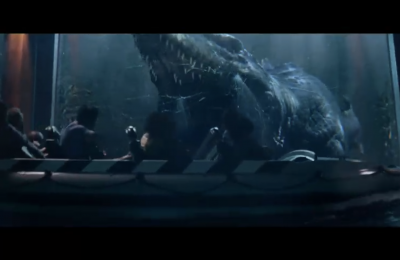 Practical effects also make movies much more realistic and believable, and the Studio Tour gets a huge part of that right as the iconic Flash Flood scene from countless movies had seen a total makeover. Video – Hang on for dear life as Flash Flood takes over the Nighttime Tour! The projections definitely bring more to life on the tour,but it’s really amazing when practical effects take over. New effects and sound have also been added to the tour, with some of the most notable effects happening during the Flash Flood. There’s something about actually seeing a flood, and being caught in the middle of it, versus watching a screen or animation. Much like the creation of an entire neighborhood. Wisteria Lane (formerly known as Colonial St.) has become a household name for many American’s as it is the home of the Desperate Housewives. The street has been given the full night time treatment and looks completely stunning at night. But what could possibly be better than a pristine New England style neighborhood? One that’s been obliterated by a crashed 747. The crash site from War of the Worlds has also received a brand new lighting package and looks very impressive at night. There is no word on how long the tour will preview for guests, and if it will be on a nightly basis. We had to call the park to verify it was going to be open tonight, which of course the park was glad to answer. The tour also does not officially open until July 4th, so it’s likely to have some major changes happening in the course of the next month. Effects could definitely be added, as well as new lighting on portions of the tour that haven’t had it yet. The creative team at Universal most certainly has done an amazing job bringing the new tour to life. It really shows their love and knowledge of film, and adds an amazing way to finish the day. 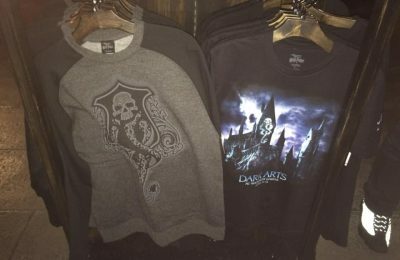 Previous PostSeaWorld CFO steps down, as company begins turn around Next PostWizarding World of Harry Potter merchandise debuts at Universal Studios Hollywood!